On Tuesday morning I met my fellow riders (Eric — who I believe is still on the road) and Michael. My friend and colleague Barb was there also, and Mel, Glenn, and Evan — the most fabulous, helpful road crew a bicyclist could ever hope for!! (Thanks you guys!) The organization of this event and the people I got to meet made this a fantastic experience. Day 1 was spent riding through country roads of Wisconsin — enjoying the beautiful hills, foliage that must have been 8 shades of green, rows of fully-grown corn and soybean plants, and the interplay of high gray clouds and misty low-lying clouds moving across the sky. At that point, we bikers owned the road and were able to chat and get to know each other. The afternoon in Illinois found us on busier thoroughfares, and we were funneled into a single-line formation — braving tractor trailers and tiny road shoulders with potholes. Rain was sporadic through the afternoon, but really was mostly refreshing as the day wore on. On Day 2 there was quite a bit of rain. But like the brave soldiers we were, we headed out en force! We made our way along some busy roads in Illinois. After some lessons in defensive driving on a bike, we moved through some pleasant neighborhoods, and then onto a lovely, lovely and oh-so-peaceful bikepath. I’ll admit (I’m probably not supposed to say this), we did get washed out for a bit — the rain necessitated some travel-by-van. Riding through Chicago was probably my favorite part — and the reception downtown was just marvelous. The total experience on this Madison-to-Chicago leg was one that I would unhesitatingly want to do again! 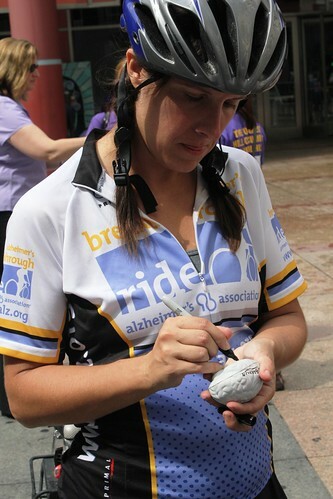 Not only did I get to assist in raising awareness for the Alzheimer’s Breakthrough Act, meet fabulous people, and undoubtedly improve my BMI, but I learned a few tips about bicycling that I’m happy to pass onto readers of this blog. These may sound obvious, but even I (a self-proclaimed master-of-the-obvious) found that these tips would be good to have in mind once mounted on a bike. Eat something! Almost everyone on the trip said this to me in an assertive — but certainly—not—chastising tone at some point over the course of 2 days. And you know what? They were right! So for God’s sake — Eat something! Cycle for a good cause!!! I’ll say no more. Everyone on this site knows this is important. I’m glad to have been a part of this event! Alzheimer’s research is certainly in need of more funding. Although I won’t be in D.C., my heart will be there. Thank you Bruce Lamb for generating the idea for this ride, and best of luck to the leadership of the Alzheimer’s Association while in D.C. and beyond!! And I send my love to those folks out there who are personally touched by Alzheimer’s disease. This ride is a sign of our (i.e., researchers, clinicians, and everyone involved in this endeavor) commitment to you. – Michele Ries, Ph.D., is an assistant scientist in the School of Medicine and Public Health at the University of Wisconsin in Madison. Interesting event! 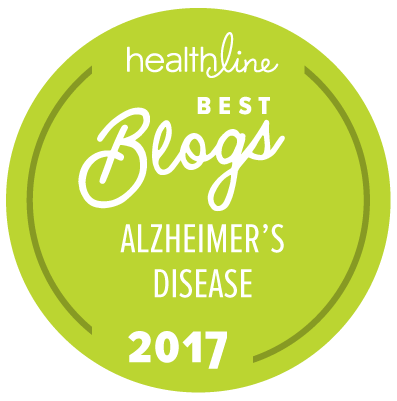 Alzheimer could be happen to anyone and research for it is very important to increase our life quality.